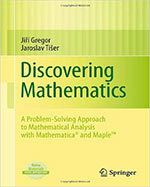 Discovering Mathematics: A Problem-Solving Approach to Analysis with Mathematica and Maple provides a constructive approach to mathematical discovery through innovative use of software technology. Interactive Maple notebooks are integral to this books’ utility as a practical tool for learning. Interrelated concepts, definitions and theorems are connected through hyperlinks, guiding the reader to a variety of structured problems and highlighting multiple avenues of mathematical reasoning. Interactivity is further enhanced through the delivery of online content (available at extras.springer.com), demonstrating the use of software and in turn increasing the scope of learning for both students and teachers and contributing to a deeper mathematical understanding. This book will appeal to both final year undergraduate and post-graduate students wishing to supplement a mathematics course or module in mathematical problem-solving and analysis. It will also be of use as complementary reading for students of engineering or science, and those in self-study.